Although you can watch from the mainland, we recommend the view from the sea. Our partners Fury Watersports camp out every year at the end of the race course in their catamaran. Not only do you see the speedboats powering toward you, but you also get to see them turn in the race to the finish. It’s the best seat in all Powerboat Races. However, if tickets are already sold out, other good spots for seeing the races are the Outer Mole and Fort Zach. The Outer Mole is probably the closest you’ll get to the boats outside of Fury’s catamaran, but if you want to spend the day on the beach after the races, Fort Zach is especially appealing. Aside from the championship races, there are plenty of other festivities happening during the week of Powerboat. On Sunday, November 6, 2016 there’s the annual boat parade down Duval Street, and on Monday, November 7, 2016, the festivities “officially” kick off with the Super Boat International Welcome Party. Also, the competing boats will be on display at the Truman Waterfront throughout the week. However, that’s not all. 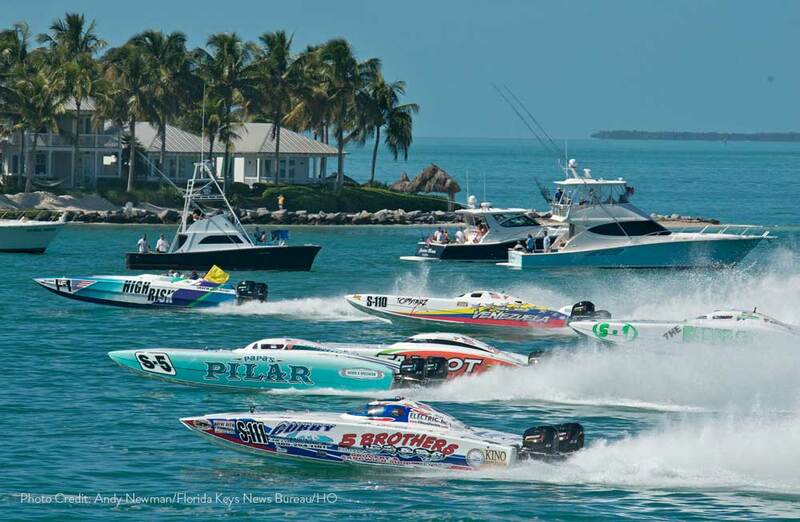 Coinciding with the Powerboat World Championships is the Florida Powerboat Club’s annual Offshore Poker Run. Starting in Miami and run through the backwaters of the Keys, the offshore poker run island-hops between Key Largo, Islamorada, Marathon, and Bahia Honda. The offshore poker run lasts from November 9-14, 2016. However, participants must register beforehand on the Florida Powerboat Club website. Sound like your type of vacation? We’ll see you in November. For more festivities and a complete list of events, check the official Super Boat International schedule here.